Shopping for a new Subaru Forester? At about $28,000, the 2019 Subaru Forester Premium is all the crossover SUV most families will ever need. The 2019 Subaru Forester sweats the small stuff. 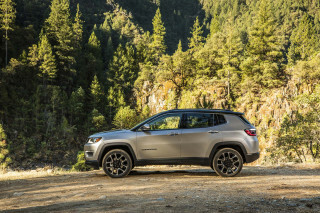 A redesign for 2019 keeps the plucky crossover SUV’s virtues such as a spacious interior, good fuel economy, and plentiful safety tech intact, but improves the experience in countless ways. The 2019 Forester’s interior has an upscale feel with pockets and storage bins for just about everything; new underpinnings give it a silent, smooth ride; and it has even more ability to haul whatever its active owners might throw in or on it. It's so good, we named it our Best Car To Buy 2019. This year’s Forester lineup comes in five trim levels—base, Premium, Sport, Limited, and Touring—all with a 182-horsepower 2.5-liter flat-4 engine, continuously variable transmission (CVT), and all-wheel drive. Last year’s turbo engine has been discontinued and Subaru doesn’t seem keen to replace it. The newest Forester looks a lot like its predecessor, and its dimensions aren’t much different. 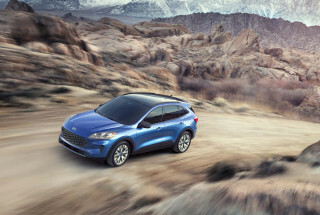 Its evolutionary looks mask a new, far stiffer platform shared with the brand’s Impreza sedan, Crosstrek crossover SUV, and Ascent three-row crossover SUV. The new architecture gives the 2019 Forester a much smoother, more composed ride than before. 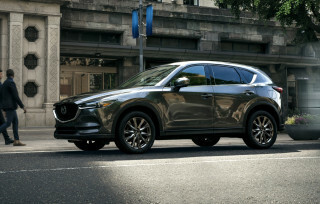 Its handling remains lively and precise, if not as engaging as the Mazda CX-5. The Forester Sport’s 18-inch wheels and orange accents give it a zippy look, but its only sporty bona fide is a snappier sport sharp drive mode accessible at the press of a button. 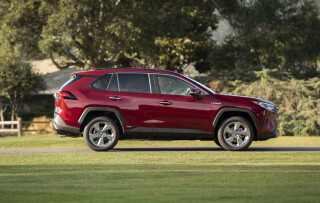 For an all-wheel-drive crossover SUV, it’s light at about 3,500 pounds in Premium trim. Combined with a CVT that’s tuned to provide quick, almost abrupt acceleration response at speeds around town, the Forester accelerates adequately in most driving situations. 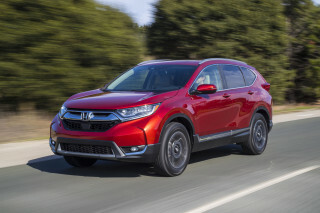 Only highway passing, climbing grades, and freeway on-ramps prove challenging, but no more than in competitors such as the Honda CR-V and Nissan Rogue. The Forester’s 8.7 inches of ground clearance and a button that changes its traction control parameters give this crossover SUV more four-wheeling capability than most competitors. All-wheel drive is standard. Inside, the Forester looks a lot like its siblings. Its design isn’t especially imaginative except in dressy Touring trim, but it is well laid-out and nicely equipped. A 6.5-inch touchscreen for infotainment with Apple CarPlay and Android Auto compatibility is standard, while uplevel trims use a flashier 8.0-inch touchscreen. The Forester’s front seats are firm and supportive, with height adjustment for both passengers. Its rear seat is especially spacious thanks to a slightly longer wheelbase. The Forester excels at carrying cargo. Its tailgate opens garage door-wide to reveal a low liftover height and a boxy cargo hold ready for whatever owners throw its way. 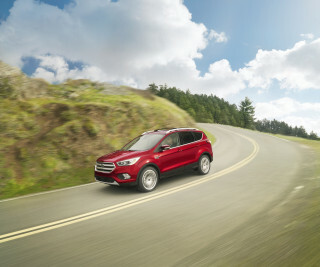 Subaru fits automatic emergency braking, active lane control, and adaptive cruise control to every Forester. Blind-spot monitors and rear cross-traffic alerts are optional on mainstream trims and standard on Forester Limited and Touring. The Forester Touring uses facial recognition software to monitor the driver’s attentiveness. Look down to send a text and, like a parent in the back seat, it’ll admonish you with a beep. At first glance, the 2019 Subaru Forester doesn’t look much different than last year’s model. And at second glance, well, it still looks like the 2018. It’s not particularly shapely, but the Forester has a purposeful, chunky look that works well—especially covered in mud. The 2019 Forester’s two-box shape is angular, with a big, vertical grille and bird-like headlights that poke well into its fenders. From the side, the tall windows that give occupants stellar outward vision don’t do much for looks—but that’s fine with us. At the rear, the Forester’s extra-wide tailgate slices its C-shaped taillights in half when opened. The standard cloth upholstery has hard-wearing vinyl bolsters and a sporty, tech feel like on some athletic shoes. The Forester Sport swaps in orange and shiny black accents that give it a little more styling zest, but those changes hardly alter its personality. Brown leather trim exclusive to the Touring trim that’s repeated on the doors, dashboard, and center console drape the cabin a warm, inviting hue. The base Forester rides on 17-inch steel wheels with hubcaps but most buyers will probably spend the extra $600 for more durable and attractive alloy wheels. Limited and Touring trims have 18-inch wheels. Inside, the Forester’s dash shares its basic shape with the Impreza and Crosstreks parked across the Subaru showroom. Its look is functional, with a standard 6.5-inch touchscreen for infotainment perched high with big volume and tuning knobs. Optional on Sport and standard on Limited and Touring trims is an 8.0-inch touchscreen. Forester Sports have black and gray cloth upholstery with orange stitching and orange trim accents around the dash for a style that looks straight out of a North Face factory. 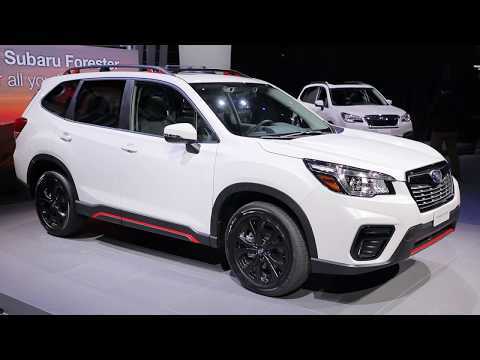 With 182 horsepower from its 2.5-liter flat-4, the 2019 Forester provides adequate acceleration that’s typical for a compact crossover SUV. Even with its standard all-wheel drive, the Forester tips the scales at around 3,500 pounds, which gives it a good power-to-weight ratio. A well-behaved continuously variable transmission (CVT) makes the most of what power is available. The transmission is tuned to provide snappy acceleration from a stop, which helps the Forester feel more sprightly around town than some other CVT-equipped crossovers such as the Nissan Rogue. While engine noise could be better silenced, the Forester’s transmission does its best to keep engine revs low. The Forester’s chunky steering wheel feels good to hold and delivers responsive, quick handling aided by a brake-based torque-vectoring system that squeezes inside wheel calipers in hard cornering to provide a more nimble feel. There’s more lean into corners from the soft suspension and the tires’ relatively tall sidewalls than in the Mazda CX-5, but the Forester absorbs rutted pavement with far more composure. Even rough potholes on a graded forest service road didn’t upset the Forester. On the highway, our initial preview drives revealed an especially quiet, stable cruiser with terrific outward vision. Subaru fits all Foresters with all-wheel drive; no front-wheel-drive version is available. That may not be a big selling point in Miami—although it’s a nice perk for rainy days—but there’s no fuel-economy penalty. With 8.7 inches of ground clearance and off-road traction control modes accessed via a control knob on the center console, the Forester has more off-road chops than most competitors. It’s almost unbeatable with winter tires, which helps explain its popularity in places where snowfall is common. The 2019 Subaru Forester has room to spare. Its exceptionally wide tailgate and doors open to reveal a spacious interior with nice finishes and materials. The 2019 Forester’s front seats are comfortable and firm and the higher seating position grants good outward vision. The base Forester’s driver’s seat is manually operated, while Premium and higher trims have a 10-way power-adjustable seat. An 8-way power-adjustable passenger’s seat is fitted to the Forester Touring, a relative rarity for a compact crossover SUV. The center console intrudes on front-passenger space, keeping the Forester from our front-seat merit badge. Second-row riders have tremendous legroom—nearly 40 inches. Ingress and egress is especially easy. The seat itself is wide and well-padded, with good space for three abreast. All but the base Forester also include rear-seat climate control vents. The Forester’s tailgate—power operation is optional on the Premium trim and standard for Limited and Touring—opens especially wide to reveal 35.4 cubic feet of cargo space with the rear seat upright and 76.1 cubic feet with the back seat folded flat. Those figures are for Foresters without the power moonroof; the glass panel and its mechanism robs about 5 cubes due to a lower headliner, but that’s space we wouldn’t recommend filling anyway. The Forester still has a 32-inch cargo area height with the moonroof and can accommodate upright bicycles with their front wheels removed. Numerous small storage bins fill the Forester’s doors and center consoles, although they don’t top the hold-anything flexibility of the Honda CR-V. The standard cloth upholstery has a tough, durable feel. Forester Limited and Touring trims have leather upholstery that’s more easy-clean than luxo-soft. The Forester’s door panels and dashboard have a pleasing mix of soft-touch materials, low-sheen surfaces, and contrasting stitching. In its cargo area, the Forester comes with a rubber mat and grained plastic surfaces the automaker says were designed for easy cleaning. 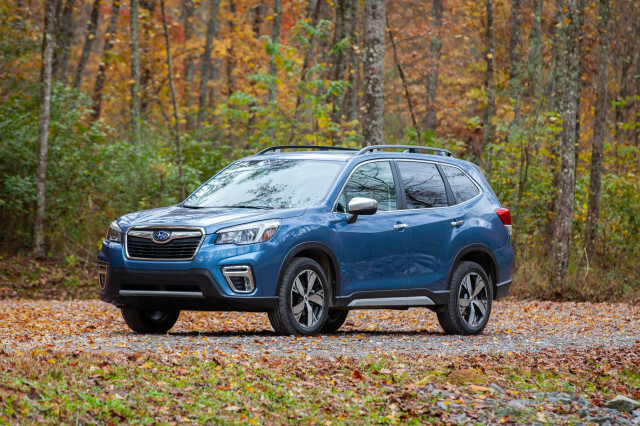 The IIHS pegs the 2019 Forester as "Good" in all its measured crash tests, but gives the Forester an "Acceptable" rating for its headlights in most configurations. It earns a Top Safety Pick+ award with the LED headlights included on high-trim versions. The federal government rated the Forester at five stars overall. The 2019 Forester has a strong active safety feature set to start with, however. Every trim level comes standard with adaptive cruise control, active lane control, and automatic emergency braking. Blind-spot monitors and reverse automatic braking are optional on the Forester Premium and Sport and they’re standard on the Limited and Touring trims. LED headlights are standard on all trims, but only Limited and Touring have headlights that move with the steering wheel. Additionally, the Touring features facial recognition technology that monitors the driver to look for signs of drowsiness or otherwise distracted driving. If the system detects a discrepancy between the driver’s actions and the car’s movement, it will sound an alert. The system doesn’t have a camera that records drivers, but it can remember up to five drivers’ audio system and memory seat settings. In our testing, it worked well to quickly recognize drivers and adjust seats accordingly. It may creep out drivers who would avoid an iPhone with its face-recognition unlock, but at least here, it’s a functional feature. The base Forester comes standard with power features, automatic climate control, a 6.5-inch touchscreen for infotainment with Apple CarPlay and Android Auto capability, automatic emergency braking, adaptive cruise control, and active lane control. Subaru charges $600 for a roof rack and alloy wheels that replace the bare-bones, rust-prone steel wheels with hubcaps. The Forester Premium costs about $27,700, and it’s loaded with small details that add up to a more comfortable vehicle: alloy wheels, roof rack, 10-way power driver’s seat, tinted windows, rear-seat vents, a cargo cover, illuminated vanity mirrors, remote engine start from a smartphone app, and more. A package with heated seats, blind-spot monitors, and keyless ignition costs about $1,300, and a power tailgate is a reasonable $550 more. For a hair under $30,000, a well-optioned Forester Premium is the one we’d buy. The Forester Sport adds 18-inch wheels, an additional drive mode, automatic high-beam headlights, keyless ignition, heated seats, and a few other features for a hefty $2,100 more than the Premium. Unless you’re smitten with the Sport’s orange trim accents, the Forester Limited for about $31,800 is a better buy. It adds to the Premium leather upholstery, heated front seats, LED headlights, dual-zone automatic climate control, automatic high-beam headlights, keyless ignition, and an 8.0-inch touchscreen for infotainment with upgraded software. A heated steering wheel, navigation, and Harman Kardon speakers are optional. At about $35,300, the Forester Touring tops the lineup with a memory driver’s seat, power-adjustable passenger’s seat, navigation, Harman Kardon speakers, heated rear seats, and a few other items. Generally speaking, the Forester is priced between most rivals’ front- and all-wheel-drive configurations, something to keep in mind when cross-shopping. The 2019 Subaru Forester comes in just one flavor no matter how it’s painted: Green. The EPA says that the 2019 Forester is estimated to achieve 26 mpg city, 33 highway, 29 combined. That puts it nearly on par with the Honda CR-V (27/33/29 mpg) and ahead of every other all-wheel-drive rival. The only way to get a compact crossover SUV that’s greener is to go for a diesel-fueled Chevrolet Equinox or GMC Terrain or opt for the Toyota RAV4 hybrid. Some competitors do have lighter weight, less thirsty front-wheel-drive crossover SUVs, but every Forester comes standard with all-wheel drive. All Foresters have a stop/start system that cuts the engine out when idling in certain situations. The system is largely unobtrusive.